The Marina Byblos Hotel is a delightful and modern hotel ideally located on the Dubai Coast, close to a number of the most popular attractions in the area including the Dubai Marina Mall, Marina, Montgomerie Golf Club, the Ibn Batuta Mall and the Emirates Golf Club. The hotel offers a range of facilities for guests to enjoy including an outdoor swimming pool, ideal for relaxing in during the day or after a busy day sightseeing. There is also a health club with spa services for those seeking to relax and unwind fully, plus there is also a rooftop terrace where guests can relax further and soak in the delightful sunshine. For dining there are a range of different eateries including a coffee shop, lounge bar, English pub and two restaurant where guests can enjoy a wide range of local and international food and drink. 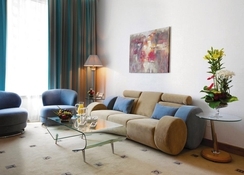 Each of the rooms are decorated in a crisp and modern style. They come equipped with coffee and tea making facilities, hairdryer, TV, clock radio and Wi-Fi connectivity. The hotel also offers a business centre which is ideal for those on business trips. Free perks include parking and a beach shuttle. 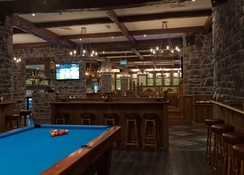 Dining options include a relaxed all-day restaurant, an English-style pub and a grand Russian-inspired eatery hosting regular live entertainment. There's an outdoor shisha lounge, a poolside bar and a nightclub, plus a rooftop outdoor pool, a gym and a sauna. A spa and a beauty salon are also available. 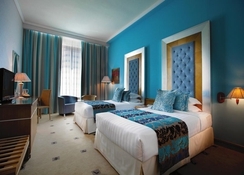 Each of the rooms are decorated in a crisp and modern style. They come equipped with coffee and tea making facilities, hairdryer, TV, clock radio and Wi-Fi connectivity. The Marina Byblos Hotel is set within Dubai, the fast paced, fast growing city well known for its lavish hotels and resorts, it’s now hard to believe that Dubai was nothing more than a dessert landscape just short of 25 years ago. Dubai is now a modern metropolis of impressive buildings, tourist attractions, and stunning manmade islands. One of the most stunning districts of the Dubai is the Jumeirah Beach area, this neighbourhood is home to the Wild Wadi Water Park, a sprawling fun-filled water world located on the Jumeirah Beach, Wild Wadi Water Park is designed around the tale of Juha, a known character from the Arabian folklore, situated in front of the stunning Burj Al Arab, enjoy a myriad of water activities including water slides, pools and water rapids, also in the Jumeirah Beach neighbourhood is the stunning Jumeirah Mosque, here you can enjoy a guided tour, and Ski Dubai, an indoor ski slope. Nearby are the Dubai Marina and the Dubai Marina Mall.